establishing territories and finding a mate. If you can learn the calls of three common owls like the Great Horned, Eastern Screech and Barred owls, you are ready to start your owl search. And, late fall through the winter is an excellent time to listen for owls in your own backyard trees or in a wooded area close to you. Spread across most of the country, at least one of these three owls — the Great Horned owl, Eastern Screech owl and Barred owl — are likely your neighbors in a wooded area somewhere nearby. 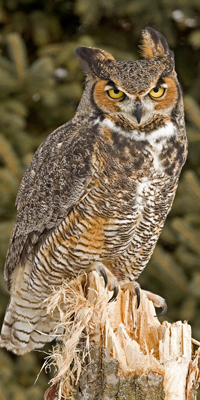 The Great Horned owl uses a broad range of habitats that includes young woods with fields or other open spaces nearby. One of the fiercest night predators, these owls have been known to take birds and mammals even larger than themselves, but will mostly eat small rodents, frogs and songbirds. Males and females can be distinguished by their calls. The male has a deeper voice and they will often call together when establishing a breeding territory. Their call is a repetition of soft hoo-hOO-hoo-hoo. 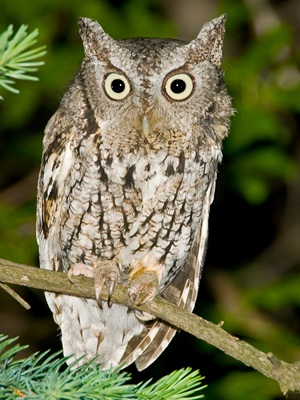 The Eastern screech owl is a woodland tree-dweller often found near bodies of water. These are some of the most difficult owls to spot because they are so excellently camouflaged against trees. Their call is a very distinct trill or whinny. as they move through the woods hunting prey and establishing territories. Barred owls do not migrate and it is thought that they mate for life. When establishing a territory or protecting an existing one from a predator, Barred owls call loudly. Take the time to learn the calls of owls near you and start listening at night. When you are still and listening, often you will hear the call so close, you’ll wonder how you ever missed knowing that owl was there!